Happy #fashionwednesday!!! If you are ANYTHING like me – you are getting REALLLL tired of the cold grey weather of winter. I am SO beyond ready for it to be spring and to start getting a little bit warmer. I am feeling like a stuffed sausage and the extra layers are basically not helping that situation at all. 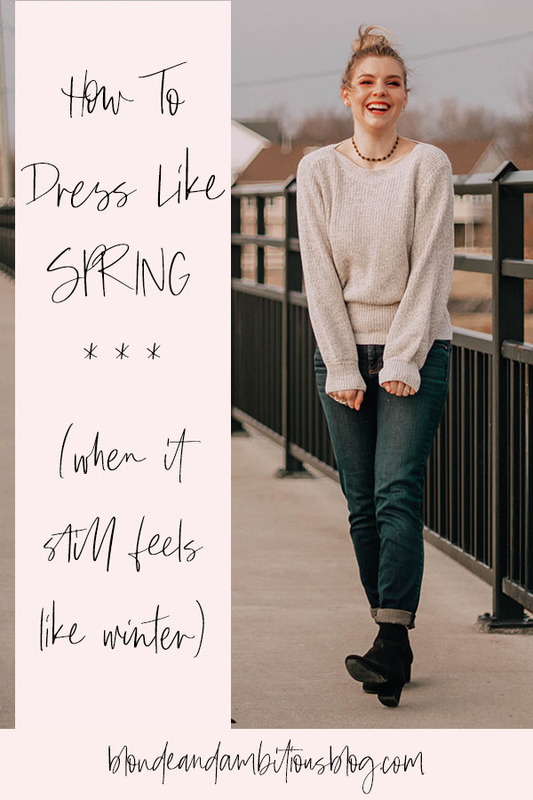 So, today, I am going to be sharing how to dress like spring – without sacrificing warmth – when it’s still winter outside. Let’s dive into this. I think this is probably the BIGGEST key point to this whole thing. Fabrics make a huge difference – especially with temperatures that fluctuate daily. 40 degrees one day, 16 the next – it’s hard to know how to dress day to day. I’d go for breathable cotton fabrics that have a bit of weight to them. Other great options are suede, leather (or faux leather), twill and poplin. 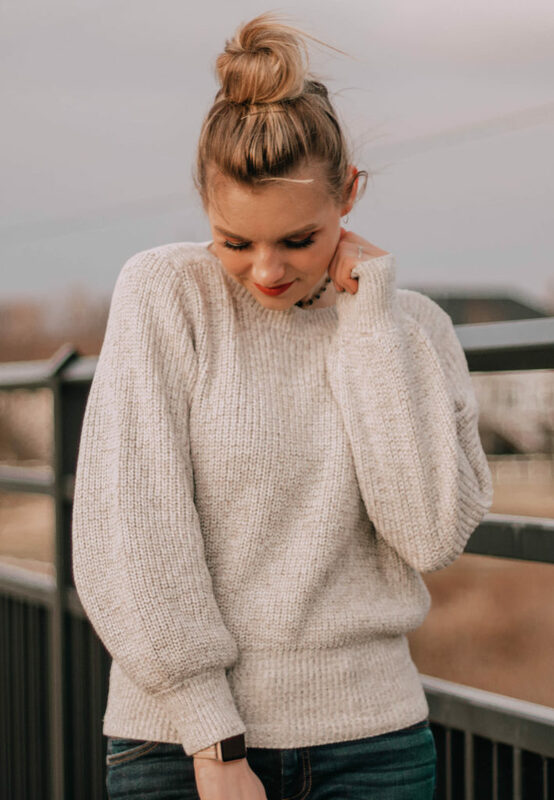 I love going for lighter cotton sweaters that are still long-sleeved. 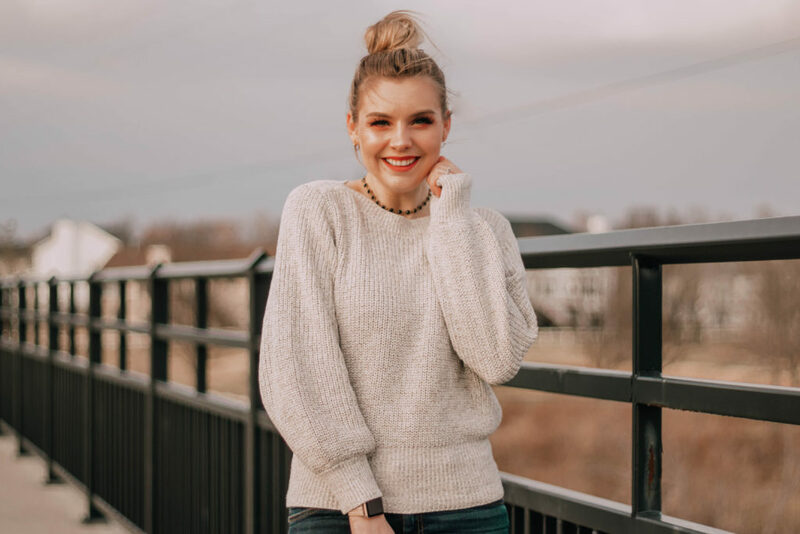 Light sweaters are still definitely in this time of year and should be taken advantage of! Keep it simple. That is the best way to approach layering this time of year. You don’t need a sweater, a vest, a scarf, and a jacket all at the same time. Instead – opt for a sweater, a denim jacket and a light scarf. Or – go the athleisure route with a long sleeved top, vest and fleece-lined leggings. Keep the layers minimal, but warm. If you do need to wear a coat – skip the heavy blanket scarfs and go for a lighter infinity scarf instead. This is the EASIEST way to start dressing like spring. 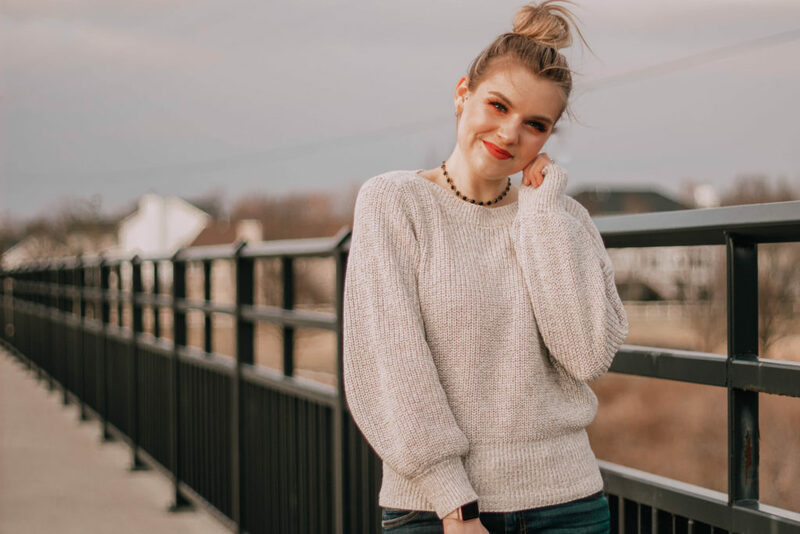 Instead of completely changing everything out in your wardrobe: start changing the colors of what you are wearing to reflect more spring-like ideas. Trade out your dark denim for some lighter washes, or some distressing. Stop wearing blacks and dark grey and maroon – instead opt for light rose or pink shades, light grey, mint green or lavender. Add in those ground-breaking florals and soft patterns to the mix and take out the heavy plaids and moody colors. Pick a good trench coat. Trench coats are sometimes the unsung heroes of spring wardrobes. They are the PERFECT weight for this time of year. A really good water-resistant trench coat is ideal because spring is notoriously rainy and it will also double in keeping chilly winds out. For a casual style, a hip-length trench coat is IDEAL, and for something with a little bit more class: a knee length trench coat can be super chic. 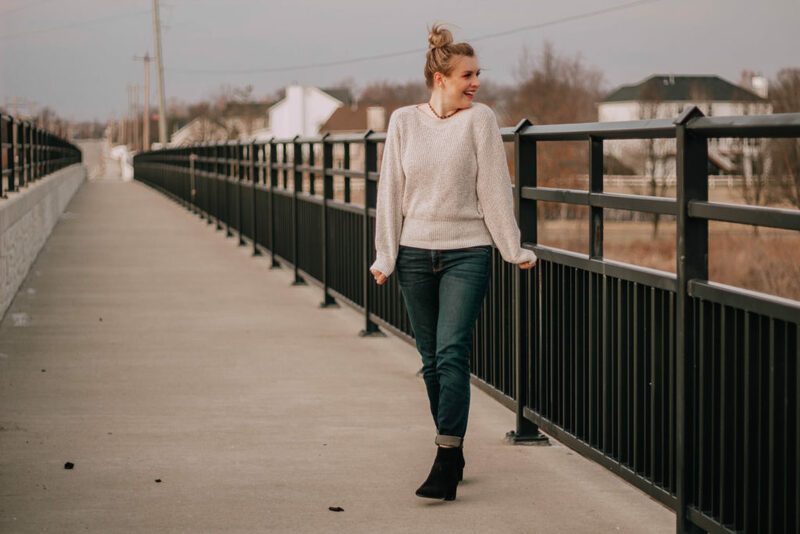 They’re really comfortable, without being heavy, and also accentuate the smallest part of your waist so you don’t feel lumpy or overly layered! Ankle boots are still in during spring, my friends! Don’t put them away just yet. Keep your open toed faves for when the weather is a bit warmer, and stick with your best close toed booties for now. I personally love my black suede ankle boots, my taupe lace ups, and my red ankle boots for a pop of fun color. I would start phasing out your tall riding boots or duck boots – but definitely keep your rain boots out for those rainy days! They’re warm and totally spring-appropriate. 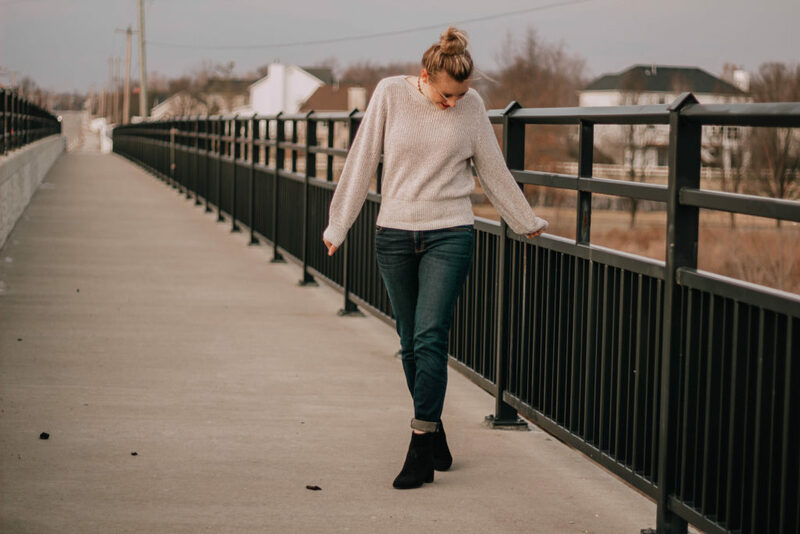 I hope that these steps help you take your wardrobe from blah colors and thick layers to brighter colors and lighter layers – while still keeping you warm during these transitional months. What is your favorite way to transition your wardrobe for spring? Let me know in the comments below! I feel like the lighter colors tip is the one I always gravitate towards during these later winter months. It can be so cold but I still want to dress for the upcoming season. These are awesome tidbits! These are great tips babe! Love wearing lighter colors for the transition into Spring and yes to ankle boots! Lighter colors for me would be the easiest way. With wind chill, it’s -50’s where I live. Yep. Yikes. I’m either housebound or looking like a polar bear! I love that sweater! It looks so cute on you! Great tips! I really want it to be Spring already – we had a 7 degree day today!! omg it has been so cold this winter! lol i can’t wait for it to be spring already and wear shorts and skirts again! This is such a great idea! I love your outfit! Love these tips! I start to get so antsy when it feels like it should be Spring but the weather can’t make up its mind. 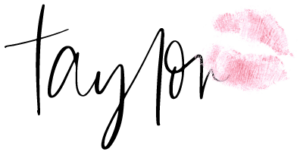 Thanks for sharing this awesome blogs. with us.